For many people, owning a home is still a significant milestone in their financial and credit journey. We recently studied the impact of millennials’ student loan debt on their willingness and ability to obtain new mortgage loans. As the housing market continues to remain competitive, we looked at key trends in FICO® Score distributions and default rates for those who have proven they would like to and are able to obtain mortgage loans. The first clear trend observed around newly originated mortgages is that as we get further away from the Great Recession, underwriting criteria seems to have eased and a broader section of consumers are obtaining mortgages as a result. 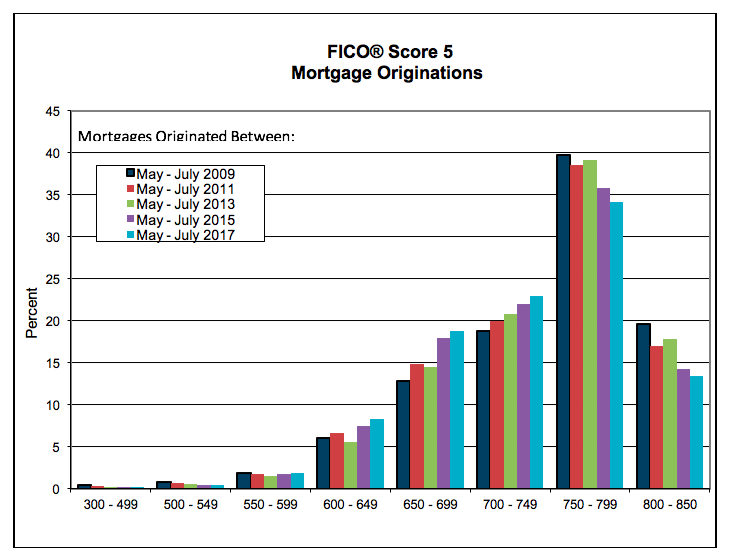 Figure 1 contains a FICO® Score distribution for mortgages opened in different periods between 2009 to 2017. We see that the percent of new mortgage account openings with FICO® Scores less than 750 has climbed significantly in recent years, from just 41% of mortgages originated in 2009 to 53% as of 2017. Another reason for the downward skew in the FICO® Score distribution among newly originated mortgages is likely because there are fewer refinances occurring today. Many high scoring consumers took advantage of the historically low mortgage rates observed in 2012-2013 to refinance their mortgages. Once the refinance boom ended in 2014, the volume shifted back to purchase mortgages, which tend to be a lower scoring population than the mortgage-experienced refinance segment. 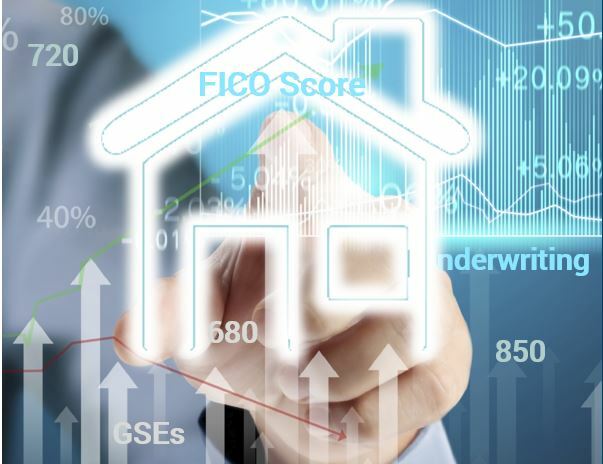 With mortgage interest rates increasing and the loosening of qualifying criteria expected to continue in the near future, it wouldn’t be surprising to see FICO® Score distributions for new mortgages to continue to trend downward. 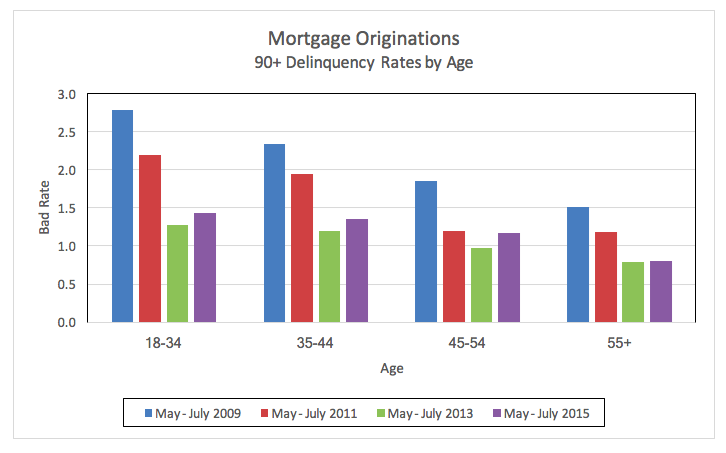 Also, building off our millennial research, we quantified how mortgage 90+ day delinquency rates over 2 years vary by borrower’s age. As shown in Figure 2, mortgage delinquency rates among younger consumers are higher, as younger consumers typically have a less established, secure financial situation and lower FICO® Scores. Among those with 1+ newly originated mortgages on file, the youngest age cohort (18-34 year olds) had an average FICO® Score of 728, which is 18 points less than the average FICO® Score of 746 for those who are 55+. Additionally, as the economy has improved over the past decade, so have mortgage delinquency rates. Note, however, that this trend has begun to reverse in the most recent time period (Figure 2); perhaps the loosening of qualifying criteria is outweighing the improvement in macroeconomic conditions and yielding slightly higher mortgage delinquency rates. If the loosening of qualifying criteria continues and economic conditions worsen, mortgage originations bad rates could increase further. As always, prudent lending practices dictate that all of the “four Cs” of credit be considered: credit behaviors, capacity, collateral and conditions (including economic factors). Following these practices can lead to sustainable levels of credit being granted at fair terms and help maintain low levels of mortgage originations delinquencies through changing economic situations. So what kind of credit behaviors of mortgage borrowers drove credit score changes? In addition to researching trends in mortgage underwriting, FICO explored the credit behavior of people with new mortgages to determine which behaviors are driving FICO® Score increases and decreases. How many consumers are exhibiting positive credit behaviors and driving score increases? How many consumers are exhibiting less favorable credit behaviors, leading to score decreases? We used a nationally representative sample to identify roughly 2.8 million with a newly opened mortgage between May 2017 and July 2017 to explore and contrast the credit behaviors of consumers that experienced a score increase and those that experienced a score decrease over the subsequent year. Among those within this profile, we found that 12% of consumers had a significant increase in their FICO® Score 5 between April 2017 and April 2018. We defined a “significant increase” as those with a 40+ point change in score. Another 11% of consumers had a decrease in their score of 40 or more pointsand the remaining 77% of consumers had a relatively stable score change of less than 40 points between the two periods. To better understand and quantify financial actions of consumers who experienced significant score increases or score decreases, we looked at credit behaviors of these two groups of consumers across a variety of dimensions such as amounts owed, on-time payments, and searches for new credit. Our analysis found that consumers with a FICO® Score increase were more likely to have reduced their amounts owed. “Amounts owed” makes up about 30% of the FICO® Score calculation; not having high revolving balances and paying down installment debt are two indicators of a healthy credit profile. On average, the consumers with an increase in a FICO Score reduced credit card balances by 49%, while those that had a score decrease increased their credit card balances by 97%. Over the course of a year, consumers with an increase in a FICO Score on average paid down their installment loans at a rate three times greater than that of consumers that had a decrease in score. We also found that as of April 2018, consumers with a decrease in FICO® Score were much more likely to have had a missed payment in the past year. “Payment history” is the most important category within the FICO® Score, comprising ~35% of the total score calculation. The FICO® Score rewards on-time payment behavior, and reflects the risk of those who have frequent missed payments. Consumers that experienced a score decrease also tended to apply for more new credit during the period evaluated. The number of inquiries associated with a consumer applying for credit increased 22% for those with a FICO Score decrease , while for consumers who experienced a FICO Score increase, inquiries decreased by 21%. FICO research has found that opening several credit accounts in a short period of time represents greater risk of future missed payments- especially for people who don’t have a long credit history. The amount of “new credit” a borrower has makes up about 10% of the overall FICO® Score calculation. As the data and research have shown, consumers with newly opened mortgages who showed significant score improvement tended to pay their bills on time, pay down debt and apply for credit less frequently. Those whose score decreased tended to have delinquency and to take on more debt. Those who open new mortgages, should keep three things in mind: pay bills on time, reduce amounts owed, and apply for new credit only as needed. Of course, this doesn’t just hold for mortgage borrowers: it is important for all credit active consumers! To learn more about the five factors that make up the FICO® Score, and review educational tools and resources related to the FICO® Score, go to myFICO.com.